Thanks for talking us through how your ideas evolved Susie, it is so helpful. I like all the ideas but like you actually like the flowers in the vase best of all. I used Anemone ‘Mr. Fokker’ this week too so its nice to think of us enjoying the same flowers in our homes so many miles apart. Silver works so well with flowers, I’ve not really realised that before, I have a silver vase I like to use but hadn’t been aware just how much silver enhances the flowers. Always something to learn. Have a great week. Never sure how much detail to give so I appreciate your feedback. I’m amazed the flowers went together so well in a vase after that circuitous journey. I have you to thank for anemones. Seeing yours inspired me to grow them. The silver tray was fun to experiment with but was hard to photograph. Kept seeing my camera’s reflection and so often couldn’t get the shot I was after. Interestingly I had intended to use a red wooden tray as well–would have made a totally different look. Another magnificent inspiring experiment Susie! 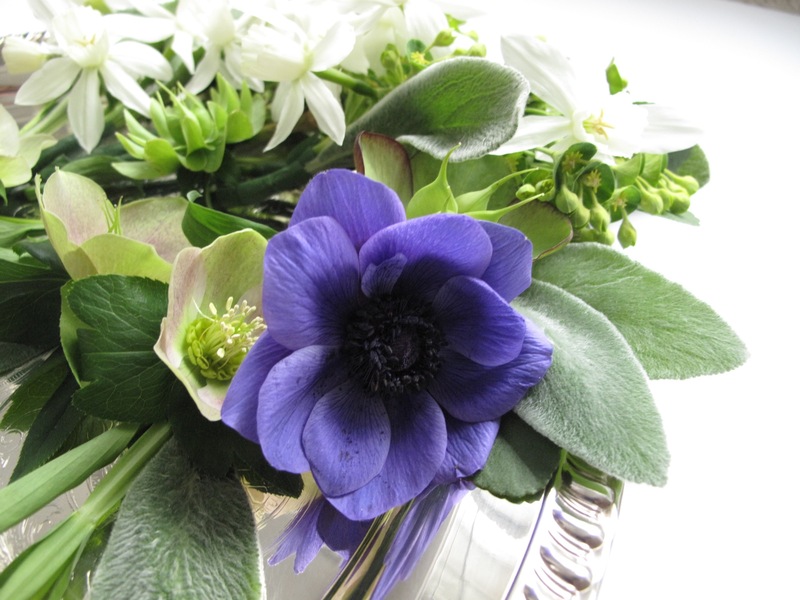 I love how they look as boutonnières and then arranged on the tray…and lastly in a vase, again they look amazing! Thanks Donna. Never got back around to my original idea but it was fun to play. Thanks Judy. Bet your daffodils are lovely and best of all, bringing you joy–the best thing about flowers. Cathy, I had planned to just discard the flowers after working with them but my heart said no, so I put in a vase and made sure there was plenty of water. They look very fresh this morning. Having never handled flowers for such an important event as you’re planning, I can only say do practice ahead with the same flowers you’ll be using. Conditioning them before arranging would be very important. You must be thrilled about the upcoming wedding. I really like all of the detail here Susie, interesting to hear your thought processes and the part where you had lost interest and gone on to something else, I like the use too of the perennial sweet pea leaf but above all I like the colour combination and lectures. Lovely as always. Thanks for your helpful feedback Julie. I liked the little tendrils on the sweet pea. These colors have to be my favorite. Would love the entire garden to be filled with them. Have a good week. Every week when I read your post I think that next week I will remember to name the specific flowers I use. It is such a useful addition to all of us plant geeks. This was a wonderful post to see such a serious thought process and all the step by step work. And everything looked beautiful on the tray. Always nice to take advantage of something silver when it’s shiny! Glad you find the materials list useful Linda. It helps me too if I need to jog my memory. The silver tray is so rarely used, it was nice to bring it out into the light. Thanks for sharing the evolution of your arrangement this week. It helps to go behind thw scenes and see into your thought process. Hi John, glad you find it helpful. Have a good week. I enjoyed your post, Susie. Each of your boutonnieres is a work of art in itself and I love the final creation. I’ll need to try your method with some of my recalcitrant blooms. Thanks Kris. I never expected to end up with those boutonnières. Glad it worked ok to just return them to water. I was just reading an article about Dr Bennet Omalu and the circuitous route his life took to become the man behind ‘Concussion’. Is it goofy to make the connection to your experimental approach? Lots of interesting stuff happened along the way, so thanks for sharing it all, as well as the stunning final product. Ricki,just read the wikipedia entry on Dr. Omalu. Thanks for the reference on this remarkable man. Goofy or not, those connections make life interesting, don’t they? Oh Susie, what a wonderfully creative and fun way to think about and then put together and then display flowers!!! I love the snippet look and the boutonniere concept. Just adorable. And to use the Lambs Ears and Shasta leaves before they are “in season” is wonderful. Love this! Thanks Libby. Lamb’s Ears are running rampant but I like them and they’re easy to pull out when they get spread too far. This time of year their leaves and also those of the Shastas happened to be looking so fresh. Glad I gave them a try. It is a very beautiful ‘regular’ vase. I love the strong shapes of the euphorbia. Those boutonnières worked so well and I have been taking notes! Euphorbia has a milky sap that wouldn’t make these practical perhaps, but I didn’t have any problem with it. It’s one of those architectural plants that I love. Love your result after all the thought, do you have an interiors background? I studied painting and printmaking, but my career was in software design. I love your little taped groupings, Susie they make me think of wedding floral items. 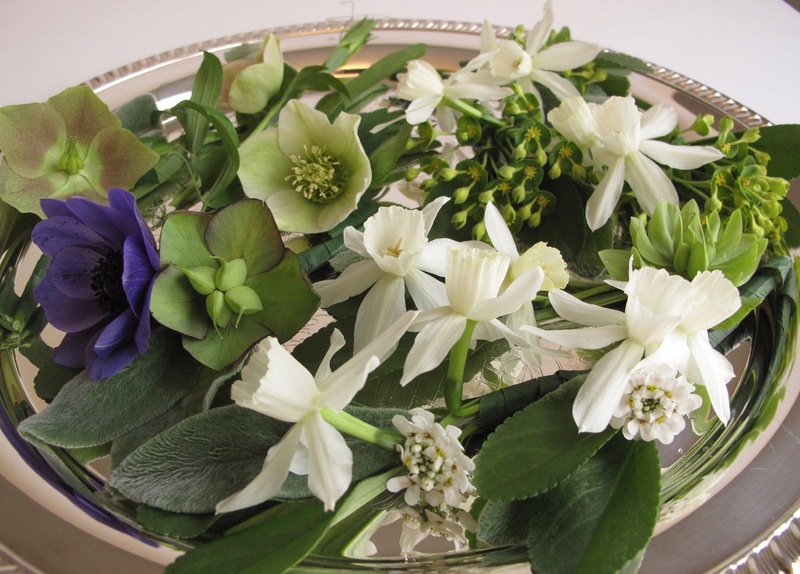 You arranged the in so many creative ways too, they look fantastic on the silver tray. 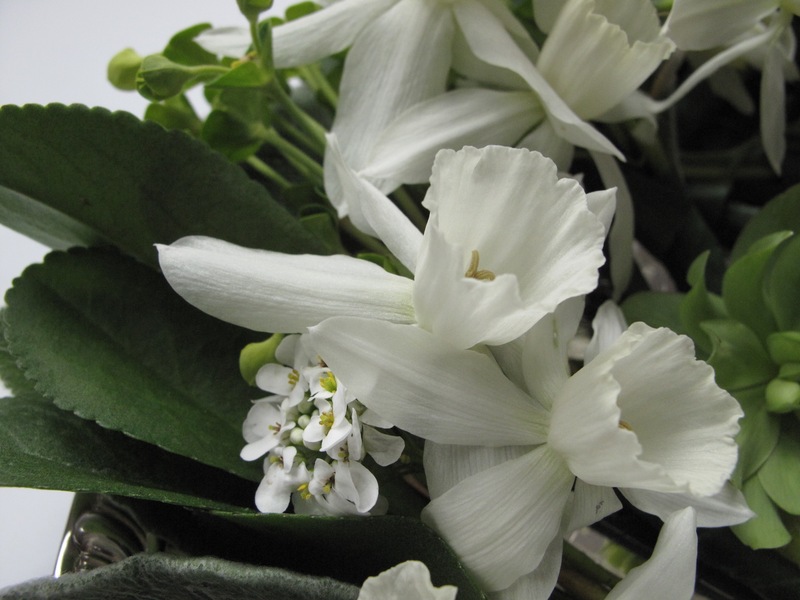 The pure white of Thalia is exquisite, I can’t wait for mine to bloom, it seems they are always last. I like your Euphorbia flowers too, I’m always reluctant to cut them because of the toxic sap, but love their exotic flowers and bracts. The brilliant purple Anemone really makes it all pop. Hi Hannah, although I hadn’t intended to initially go that direction, little flower sprays did remind me of a wedding too. Can’t imagine the pressure of creating flowers for the someone’s real day, but it was fun to experiment. Euphorbia is so interesting, but you’re right about the sap. Wow, so much work and such a stunning result! I love the idea! Thanks Anca. Everything went together quickly but I ended up with lots of unused flowers this week. The final vase is so very lovely Susie, but it is also fascinating to see how you began and the turns the process took! 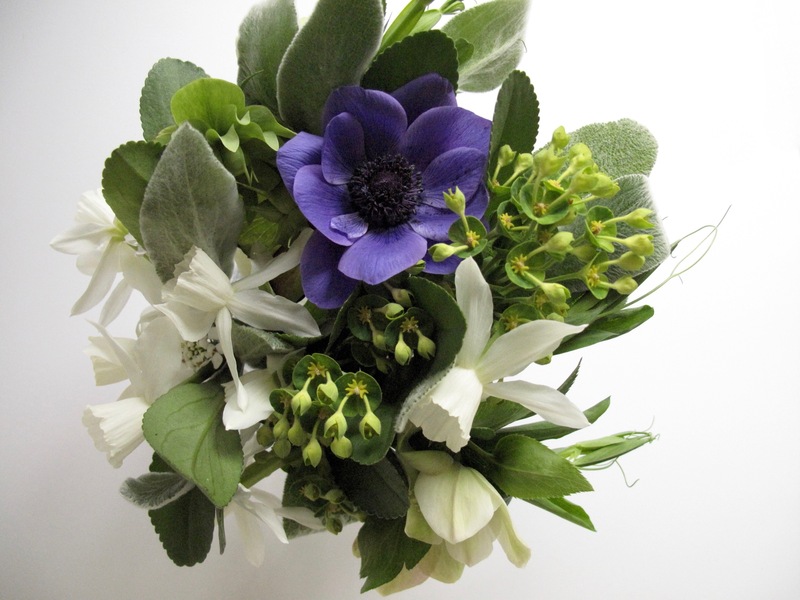 I have never even thought about how ro make buttonhole sprays – love the use of the lamb’s ears foliage. They look gorgeous on the silver tray. Thanks Cathy. I need to look up how to make boutonnières and see how close I came. Had never really thought about making them either. Now I’m curious about hand corsages, etc. Lamb’s ears are so sweet aren’t they? I love your final vase. The Euphorbia has such interesting shapes, and all those greens and purples work so well together. I was planting Thalia bulbs on Sunday. I’m looking forward to the flowers, they are supposed to have a nice scent, is it noticeable in yours? Thanks Cath. I haven’t noticed a fragrance on the Thalia, but I love the white color. I hope to add more bulbs next fall. Love the idea of multi-purpose usage of flowers, really lovely. Thanks, I had no idea where the flowers were taking me!